Lakes Garage Doors sell and install high end bespoke garage doors, front doors, and gate automation products. Launched over 20 years ago, Lakes chose us due to our track record in delivering high end, usable websites which deliver big results. 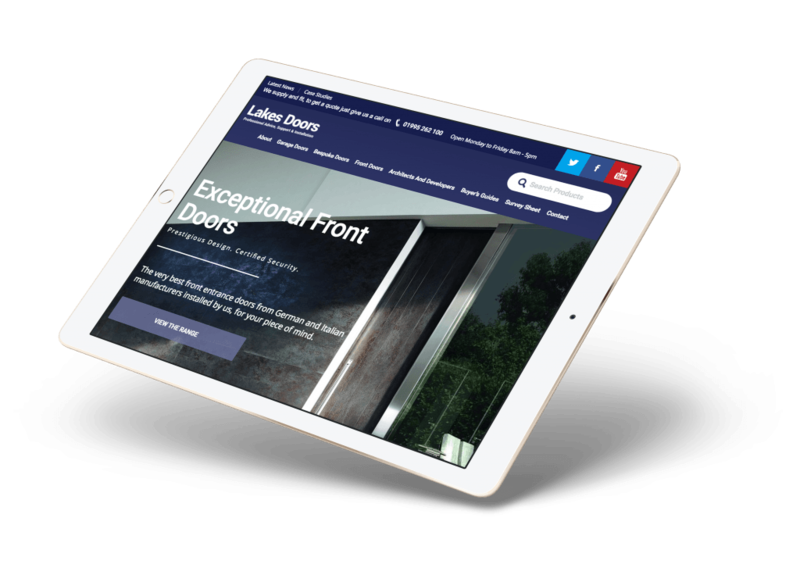 After two previous website designs, Lakes Garage Doors were coming up short in terms of conversions. The enquiries simply weren't there, the website and branding didn't reflect the quality of the products, and the user experience was frustrating and lacked accessibility. Our priority was to get to the core of their business objectives, so we took time to understand and analyse their industry approach. Investing this time in planning and developing ideas allowed the project to flow through design, development, and marketing seamlessly with a thorough understanding of the end goal. Our approach for Lakes Garage Doors involved three steps. The first was to build in the marketing strategy to ensure the site presented the most relevant content for converting keywords across organic and paid. Next up we ensured the site visually reflected the calibre of the brands they offer, and to do this with a unique aesthetic. Last, but certainly not least, we applied our trademark experience of conversion rate optimisation to aid the user experience. This also assisted with maximising ROI. For our web design and development we focused on WordPress as the CMS. We designed a bespoke faceted navigation to allow users to easily refine their product searches. From there customers could discover deeper links and with them a variety of new items, boosting the chances of conversion. Each persona was established in the discovery stage and a progressive journey was plotted through the site for customer profiles. We wanted to create a site with visual impact which presented the best user experience possible. It also had to convey a sense of luxury other brands weren't matching. To do this we built in an A/B integrated marketing strategy to the website in order to ensure the site presented the most relevant content for converting keywords across organic and paid. Bounce rates have since been halved, time on site has doubled. Thanks to a white hat SEO strategy, the brand has also risen significantly in Google’s SERPs for target keywords. We built the website on a responsive framework (the preferred method of Google), to enhance its SEO potential. We designed the mobile site to be as visually led as its desktop counterpart, and employed a simplistic dropdown menu for ease of navigation. Well positioned points of contact rounded off the design.